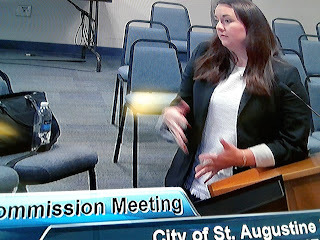 Clean Up City of St. Augustine, Florida: Will ADA-violating City Manager MAX ROYLE Get PASSPORT LABS, INC. Parking App Approved Tuesday, January 8, 2019? : JUST SAY NO! Will ADA-violating City Manager MAX ROYLE Get PASSPORT LABS, INC. Parking App Approved Tuesday, January 8, 2019? : JUST SAY NO! Paid Parking Plan Illegal? : ADA is litigation likely to challenge St. Augustine Beach's PASSPORT LABS, INC. smartphone parking app scheme. NONE of the 300 paid parking spaces is set aside for free use of disabled drivers. Federal law requires some twelve spaces suitable for wheelchair-equipped vans. Flummoxed St. Augustine Beach City Manager BRUCE MAX ROYLE was repeatedly criticized at a meeting that was conveniently not televised due to "technical difficulties" on both cable television and live-streamed video. ROYLE has NO plan for the City of St. Augustine Beach to provide some twelve (12) mandatory Americans with Disability Act (ADA) parking spaces as part of its smartphone parking app scheme for 300 parking spaces. City faces likely loss in a federal court disability rights lawsuit: Expect another lawsuit by disability rights activist Merrill Paul Roland, a prevailing party in successful ADA litigation against the other itty-bitty city, St. Augustine. Mr. Roland's torpedoed the app with a presentation from U.S. Department of Justice website about the mandatory legal duty to construct twelve solid van-sized accessible parking spaces for disabled people as a result of the planned 300 paid spaces. Legal questions raised by Mr. Roland City Commission meeting testimony could be disabling to BRUCE MAX ROYLE's hare-brained PASSPORT parking app scheme. Thanks to activist Merrill Paul Roland and Thomas F. Reynolds, Jr. for sinking the parking proposal. I raised ADA several months ago and got ignored. But armed with USDOJ rules, Merrill Paul Roland laid down the law to unsophisticated St. Augustine Beach City Manager ROYLE. No response on federal lawsuit threat from City Manger BRUCE MAX ROYLE. Nope. No response from St. Augustine Beach City Attorney James Patrick Wilson, a/k/a "Minimum Jim." The PASSPORT LABS, INC. contract of adhesion will be discussed at the special January 8, 2019 (Tuesday) meeting, which begins at 5 PM and also includes Comprehensive Plan discussion. Rules now allow only two minutes of public comment on agenda items, reduced from three because three Commissioners voted to discourage public participation and disclosures of waste, fraud, abuse. misfeasance, malfeasance, nonfeasance, flummery, dupery and nincompoopery by the Tinpot Napoleon who runs St. Augustine Beach. The PASSPORT LABS, INC. parking app scheme is the idea re-elected Mayor Undine Celeste Pawlowski George, a real estate lawyer, who says she got the idea from "a colleague" whom she still refuses to identify. The PASSPORT LABS., INC. parking app scheme was sold by saleswoman Kelsey Owens, who gets to do another snow job at the January 8, 2019 meeting. After Commissioner Maggie Kostka asked for a business plan, the City of St. Augustine Beach provided a timeline or chronology. That shows Royle's contempt for both democracy and fiduciary duty. BRUCE MAX ROYLE, St. Augustine Beach City "Manager," has done it again. The looney little louche lackadaisical lousy City Manager did not investigate, vet or prepare any business plan. He routinely violates ADA during events, ordering ADA spaces be blocked for toilets or tents. In pursuit of the PASSPORT LABS,INC. contract of adhesion,ROYLE and his cronies visited Gainesville. They did not plan to comply with ADA. They did not survey residents. They arrogantly made up a $400,000 claim of revenue in this year's budget. When that revenue does not appear, who will tell the people? How about you? Come speak at the Tuesday January 7, 2019 City Commission meeting. It starts at 5 PM with discussion on the Comprehensive Plan -- no telling when they'll finally get around to talking about this technological turkey of a privacy-invading smartphone parking app. 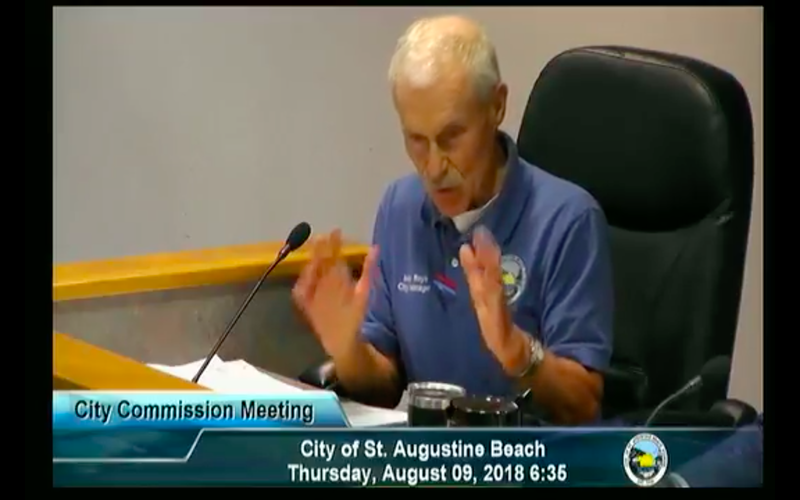 Will PASSPORT send a lawyer to explain its position on its demand for 35 cents "convenience fee" every time someone parks in St. Augustine Beach? That's some "convenience fee." Please call me about the enclosed proposed PASSPORT LABS, INC. contract of adhesion with the City of St. Augustine Beach, Florida for a smartphone parking app privatization scheme, charging people a 35 cent so-called "convenience fee" whenever they park. Your request for public records has been forwarded to the City Clerk for a response. cover memo or transmission e-mail sending draft Passport proposed contract to Commissioners, legal experts or others. revisions, updates or revised drafts since the enclosed draft contract sent in response to request No. 2018-569.
evaluation of equal protection and due process issues in not charging for parking by the Dance Studio, Jack's Barbecue and other businesses.